For awhile now, fans have been wondering exactly what Sony Pictures has planned for the Men in Black franchise. 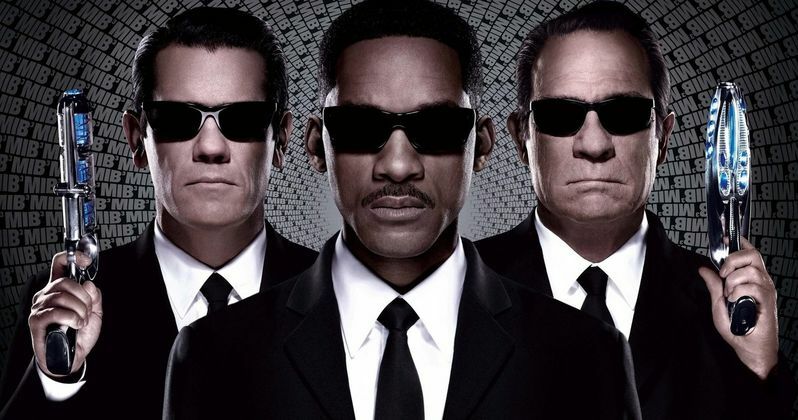 Some believed Men in Black 4 would happen, with Will Smith returning to reprise Agent K. It was also rumored that a Jump Street/Men in Black crossover was moving forward, with Jonah Hill and Channing Tatum starring alongside new MIB characters. Now, it has been confirmed by producers Walter F. Parkes and Laurie MacDonald that a full on revival is in development. And it will not involve Will Smith. The producers, who are married, were speaking with THR about their upcoming Malala documentary when they revealed their plans for one of Sony's most lucrative franchises. What used to be Men in Black 4 will now be a full on revival of the series. And it will be the first of three films with all-new characters. Says Walter F. Parkes about this full-on reboot. "We're in the middle of it. It's very active." Laurie MacDonald added this important piece of information. "It will be reinvented as a trilogy." When asked if Will Smith was going to have any part in the new Men in Black, the response was a quick, resounding, 'Most likely no.' When the Crossover movie was being discussed, it was clear that Will Smith and co-star Tommy Lee Jones wouldn't be a part of that, unless for a cameo. Of course, since that news first hit, Phil Lord and Chris Miller, who confirmed that Sony was in talks about a crossover, have since moved onto some very high profile projects. They are currently in prep to direct both a Spider-Man Animated Movie for Sony and the live-action Star Wars Anthology: Han Solo Movie for Disney and Lucasfilm. They are also working on the standalone The Flash movie for DC Entertainment and Warner Bros. They don't have a lot of time to currently devote to a 21 Jump Street/Men In Black crossover. The first Men In Black was released in 1997 and proved to be an instant hit. It grossed over $589 million worldwide. Five years passed before Men In Black II hit in 2002. It proved to be a little less popular, only bringing in $440 million across the globe. A full decade would pass before Tommy Lee Jones and Will Smith agreed to reunite again in Men in Black 3. That installment proved to be the biggest yet, taking in $620, proving the franchise still had legs. Barry Sonnenfeld directed all three movies, but it is not known if he'd return for a new MIB adventure. The producers sound like they want fresh blood all around. Perhaps once they get a reboot off the ground, with new MIB characters situated, a full on Street/Men In Black crossover can happen. 23 Jump Street is currently in development with Channing Tatum and Jonah Hill set to return. Phil Lord and Chris Miller will only produce this time around. What do you think? Are you ready for a new MIB?